I’d like to introduce you one of the best vegetables in this world, Kale. Kale is one of the healthiest plant foods in existence. Kale is also called borecole, is a type of cabbage in which the central leaves do not form a head. There are many different types of kale. The leaves can be green or purple in color, and have either a smooth or curly shape. Kale is one of many nutritious cultivars of Bassica Oleracea, others include brocoli, cauliflower, collard, and Brussels sprouts. Kale contains more than twice the level of antioxidants contained in other leafy greens, which are themselves excellents sources. Kale includes beta-carotene, vitamin C, as well as various flavonoids and polyphenols. But many substances that happen to be antioxidants also have other important functions. This includes the flavonoids quercetin and kaempferol, which are found in relatively large amounts in kale. Kale is one of the world’s best sources of vitamin C, an antioxidant that has many important roles in the body, and Vitamin K, an important nutrient that is involved in blood clotting. Kale contains substances that bind bile acids and lower cholesterol levels in the body, which may reduce the risk of heart disease. Steamed kale is particularly effective. But those are not the only beneficts of this vegetable, Kale is actually loaded with compounds that are believed to have protective effects against cancer. But also, is very high in beta carotene, an antioxidant that the body can turn into vitamin A, and many important minerals, some of which are generally lacking in the modern diet. This includes calcium, potassium and magnesium. Kale is as well high in lutein and zeaxanthin, nutrients that have been linked to a drastically reduced risk of macular degeneration and cataracts. It is prepared by pounding and processing dried soybeans with water. You can find a variety of flavors including light, sweet, full-cream, vanilla, chocolate, etc. in the market. The density and creaminess of the milk may also vary greatly and it tastes even better than regular milk. The protein content is almost similar to cow milk (around 8 grams a cup). High in dietary fiber, calcium, potassium, magnesium, vitamin B1, vitamin B2, vitamin D, plant-based omega-3 fatty acid, antioxidants, phytoestrogen, manganese, selenium, phosphorus, choline, folate, etc. Prevents prostate cancer, osteoporosis, cholesterol transportation, etc. 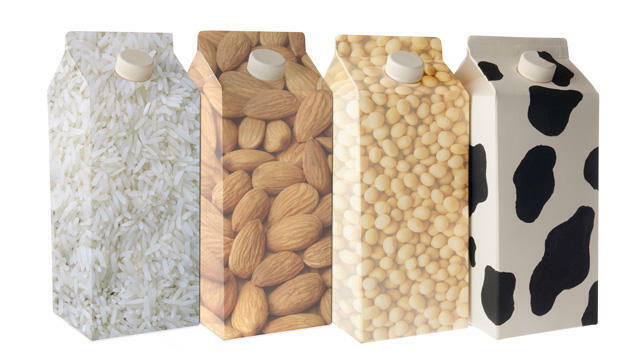 This nutritious milk is made by pre-soaking the grains of oatmeal in water and straining the concotion carefully. It is sweet in taste and thick in consistency. A variety of flavor is available in the market and you are free to pick your favorite one. Fat and sugar content is very low. Rich in soluble fibers, iron, vitamin A, vitamin D, folate, phytochemicals, etc. This thin and naturally sweetened milk substitute is prepared from brown rice grains and is considered as extremely healthy. You can also avail its vanilla-flavored version from your local supermarket. Great source of antioxidants, B-vitamins, vitamin D, calcium, etc. This wonderfully tasty vegan milk is made by pulverizing soaked almonds thoroughly. The sweet and nutty flavor and high nutrition make it highly popular among the lovers of dairy-free milk substitutes. Enriched with proteins, omega-6 fatty acids, antioxidants, dietary fibers, vitamin E, iron, zinc, magnesium, etc. It is another creamy, flavorful and nourishing alternative to regular milk, which is basically prepared by grating the ‘meaty’ flesh of ripe coconuts as well as extracting the concoction. You can get both ‘thick’ and ‘thin’ coconut milk for using as cooking ingredients and both of them are super tasty. 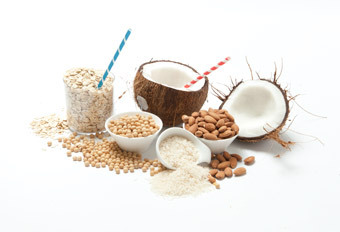 High in dietary fibers, vitamin B-12, vitamin D, iron, calcium, manganese, copper, phosphorus, selenium, etc. Cashew milk has a natural vanilla flavor and it is made of a smooth, rich blend of water and cashew nuts. It is an amazingly tasty, absolutely creamy and highly satisfying milk beverage. Amazing source of proteins, B-vitamins, calcium, magnesium, copper, etc. Being derived from tasty and savory hazelnut, this milk tastes heavenly. It also has a nutty flavor, which is very much liked by people. Like all other vegan mil substitutes, it also has high nutrition value. It is prepared from the seeds of hemp tree and is regarded as one of the healthiest choices for dairy-free milk. It is widely known for its ‘earthy’ taste and nutty flavor. Amaranth is a tiny, slightly nutty flavored ancient grain. The Aztecs believed it held the secret to long life and vitality and celebrated holidays by eating toasted amaranth. It’s a complete protein, has more iron than most grains, and is also a great source of many other miner als.Whole amaranth is delicious on its own or cooked in combination with other grains in pilafs, and in warming morning porridges with oatmeal, dried fruits, and coconut. Buckwheat Groats are rich in protein, iron, selenium, and zinc, and are a good source of B vitamins. You can cook them as is, sprout, or roast them, and buy them already roasted, also known as kasha. With its eastern European roots, kasha is a natural in stuffed cabbage rolls, in croquettes, marinated salads, and kasha varnishkes, a dish made with sautéed onions and pasta. Corn is unusual in being both a fresh vegetable and a grain available in a rainbow of colors, each with a slightly different nutritional profile, so mix it up and cook with different varieties. Like amaranth and quinoa, corn has a long history of cultivation in the New World and was venerated as a sacred food. Because all varieties of corn are low in tryptophan and lysine, it isn’t a complete protein, but all varieties of corn are a good source of magnesium and thiamin, and a fairly good source of a few other minerals and B vitamins. Corn grits, millet and teff can be cooked together in the same pot since they all take 15-20 minutes. Corn grits and polenta are delicious for a quick breakfast, or at any time of day. For a super main dish made with grits, add sautéed onion, kale, and vegan cheddar cheese. Millet is a small, round, yellow grain originating about five thousand years ago in China, where it’s still a staple. Like most grains, it tends to be a little low in lysine, so it isn’t a com plete protein. It is, however, a great source of magnesium, and a fair source of other minerals and some of the B vitamins.Millet has a wonderful sweet taste. You can toss it into any soup or stew about twenty minutes before it’s ready (this is a great way to thicken a dish that’s turned out too thin.) When cooked, it sticks together, and once it cools you can slice it, making it a great choice for polenta, croquettes, and loaves. Oats are often grown in close proximity to wheat and also often processed in the same facilities. For those with wheat intolerance, this shouldn’t pose a problem. However, if you have celiac disease, be sure to look for packages labeled gluten-free, which are carefully processed and packaged to avoid cross-contamination. Oats have a variety of health benefits. They can help lower cholesterol, reduce blood pressure, and prevent heart disease and cancer. They also enhance immune system function, help stabilize blood sugar, and may even be helpful for insomnia, stress, anxiety, depression, an d a variety of other health problems. Oats are a complete protein, high in fiber, thiamin, and minerals. Oats make a delicious breakfast cereal, cooked alone or with amaranth, teff, or goji berries, coconut, or whatever dried or fresh fruit you like, and maybe a sprinkling of cinnamon. Quinoa, similar to amaranth and buckwheat, doesn’t come from a cereal grass, so it isn’t technically a grain. Like most of the other psuedograins, quinoa is a great source of protein—one of the best plant sources, in fact—because it contains all of the essential amino acids and is rich in folic acid and several minerals . Like corn, quinoa comes in a rainbow of colors: tan, red, and, black. Each has a slightly different texture and flavor, but generally speaking, quinoa has a light sesame-like flavor, cooks in 15 minutes; tastes great on its own or mixed with other grains, and it works beautifully in stews and salads. Rice, Whole grain rice is fairly rich in fiber, niacin, a few other B vitamins, and several minerals. But when it’s processed into white rice, almost all of its valuable nutrients are lost, so it offers little beyond starch. For those on a gluten-free diet, rice comes to the rescue as pasta in the form of numerous types of Asian noodles, as well as a few good brands of rice pasta that you’ll find in most natural food stores. Rice has been bred to survive and thrive in a broad range of conditions, leading to countless varieties in existence today. Sorghum, also known as milo, is a small round grain with the texture of pearled barley. While it isn’t a nutritional powerhouse compared to other grains, it is a good source of iron, potassium, and fiber, and also provides a few B vitamins. It’s even lower in lysine than most grains, so the quality of its protein isn’t as good. When buying sorghu m, look for sweet white sorghum. It’s the best-tasting and most digestible variety. And don’t be put off by “white” in the name. That’s not white as in refined, it means the grain itself is a pale color. It has a flavor similar to untoasted buckwheat, and a texture that makes it a good stand-in for barley. Try it in marinated salads, pilafs, and soups. 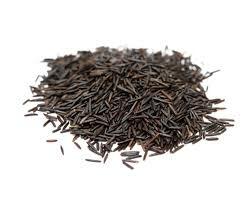 Wild Rice is a better source of protein than most true grains, containing a fairly good amount of lysine. It’s also high in many minerals and some of the B vitamins. It has a delicious nutty flavor and a pleasantly chewy texture. It blends well with other varieties of rice, making it a natural for pilafs. True wild rice has defied domesticati on, so most of the wild rice sold in the United States is from hybridized versions grown in rice paddies in Minnesota and California. Support the natives (plants and human) and seek out truly wild rice.